Spectro UV-VIS Double Beam UVD 3500 Research Spectrophotometer is a superior instrument for the research laboratory and is an advanced and affordable system that generates accurate and reproducible measurements. UVD-3500 spectrophotometer is accurate, reliable, and an exceptional value. 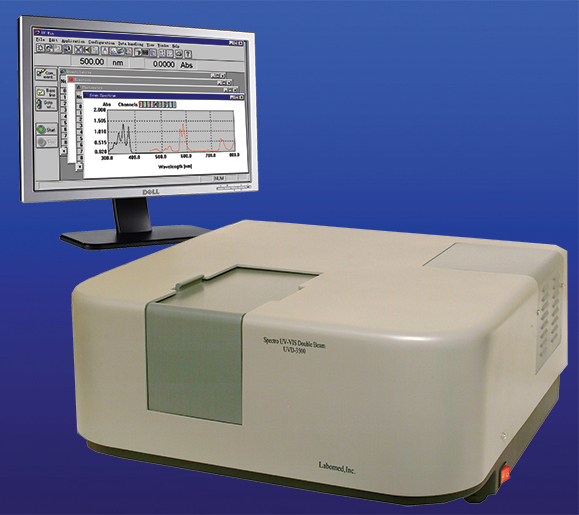 With its narrow beam design, the system provides optimal and reproducible results for micro and macro samples with high resolution for protein, nucleic acid, and DNA/RNA analysis..
Spectro UV-VIS Double Beam UVD 3500 has a powerful built-in software which permits this instrument to be linked to a computer and a printer to display the photometric and spectral data on the PC monitor. This spectrophotometer is rugged, reliable, affordable, and maintenance free. Spectro UV-VIS Double Beam UVD 3500’s enhanced transmission and full reflection makes this double beam spectrophotometer highly effective and reduces noise. Spectro UV-VIS Double Beam UVD 3500’s advantage is its accurate wavelength, ease of operation, versatile software application, and effortless optional accessory installation. This instrument can be used for analyzing solid samples through use of an optional reflectance accessory and integrating sphere. The operation manual is available in 18 different languages. Spectro UV-Vis Double Beam (Model UVD-3500) with variable bandwidth of 0.5 to 5.0 nm is a high-performance, reliable, and exceptional value instrument which is the hallmark of Labomed UV-Vis spectrophotometers. Excellent Performance : The high-performance blazed holographic grating and the optimized CT-type monochromator reduce stray light, and widen the photometric range. Ideal baseline stability: Double-beam dynamic feedback ratio recording photometric system, coupled with a reasonably designed electric control system, ensures high stability of the instrument baseline. High resolution: The unique optic design of full-transmission and full-reflection satisfies both needs of the double beam optic and the enhancement of the light energy of instrument, so as to reduce noise and to guarantee high resolution. Accurate wavelength: The automatic wavelength driving system and the automatic light source interchanging system ensures wavelength accuracy and ensures the optimum performance of the instrument. Easy accessories replacement: The detachable structure of the sample chamber facilitates change of a wide range of optional accessories and ensures the wavelength accuracy of the instrument. Easy light replacement: The open-type design of light source chamber, socket deuterium lamp and socket tungsten halogen lamp facilitates the replacement of the light source, simplifies maintenance and reduces operation error. Versatile Application: The new UVWin 6.0 application software is compatible with Windows XP, 7 and 8 offers rich operation and data processing facilities, offering a wide range of uses and applications. Now all Labomed, Inc. split and double beam spectrophotometers with our newly developed software called UV-Win 6.0 can be used with Windows XP, Windows 7 and Windows 8. It is capable of testing more applications with its RS-232 and USB connections, and supports the data export of measured results to the PC and then, if required, a USB flash drive, when additional data storage is required. One of the new features is that it provides 3-D graphing of the spectral results. Such operations as photometry measurement, spectrum measurement, quantitation measurement and kinetic measurement are offered in UV-Win Windows applications. Multi-wavelength photometric measurement at up to 10 wavelengths with the arithmetic calculation according to the user-entered formula. Up to 10 spectra and time-course curves can be measured and recalled in memory with data-handling of arithmetic calculation, logarithmic calculation, reciprocal calculation, smooth, derivate (1st ~ 4th), Abs to/from %T conversion and peak pick. Up to 24 standards can be entered and measured for the fit of calibration curve with order to 1st ~ 4th. Offered are the quantitation methods of single wavelength, two-wavelength, coefficient two-wavelength, three wavelength and 1st ~ 4th derivatives. Kinetic measurement can monitor the changes of absorbance and transmittance against time course at 10 different wavelengths. This module allows flexibility in manipulation and data display. With the Windows clipboard, the measured data and graphics can be copied to other applications software for reports. Also offered are filing functions, display functions, and others (such as auto file and repeat measure/scan etc.). Sample Chamber: With accessories like reflectance sample holder and an integrating sphere. 4 Optical Glass Cells 10mm. 1 Instruction manual available in 18 different languages. 1 Software Operation Manual available in 18 different languages. - Optical System: The monochromator of Czerny-Turner configuration with high-resolution diffraction holographic grating. - Photometric Method: Transmittance, absorbance, reflectance, energy, concentration. - Continuously variable spectral bandwidth from: 0.1, 0.2, 0.5, 1.0, 2.0 and 5.0 nm. -Detector: Hi sensitivity R928 multiplier detector. - Sample Chamber: With accessories like two-cell sample holder and optional integrating sphere. - Size: 587mm. x 562mm. x 260mm.